The anti-nuclear emblem, designed in 1958 for Britain’s Campaign for Nuclear Disarmament, is one of the most widely recognized symbols in the world. It’s often used in popular culture and advertising. See if you can come up with an inspiring peace symbol of your own. You never know, it might turn out to be as popular as the original! Have a look at some existing peace and anti-nuclear symbols. Think about what they mean and decide how effective they are. Come up with several concepts for your own symbol. Show your designs to friends to see what they think of them. Perfect one and use it as a logo for your own school peace group. Print the symbol on T-shirts, stickers, badges and more! Anti-nuclear emblem: The anti-nuclear emblem first appeared in the form of a badge made using black paint on white clay. The badges would be among the few human-made objects to survive a nuclear inferno. The design includes the naval code letters for “N” and “D” – to stand for “nuclear disarmament”. The letter “N” is represented by holding two flags in a downward position, 45 degrees from the body; the letter “D” is represented by holding one flag directly upwards and another directly downwards. Banner of peace: The banner of peace has been used in many cultures, particularly in Asia, for thousands of years. No single group has ever taken ownership of it. The central three circles represent the past, the present and the future, surrounded by eternity. Olive branch: Since ancient times, the olive branch has been used as a symbol of peace and goodwill. Its symbolic origin is probably associated with the biblical story of the dove that carried an olive branch from Noah’s Ark. It forms part of the flags of the United Nations, the League of Arab States, Cyprus and Eritrea. Paper crane: The white crane is used throughout Asia, and increasingly throughout the world, as a symbol of peace. According to Japanese culture, if a person folds 1000 papers cranes – of any colour – he or she is granted a wish. Rainbow flag: The rainbow flag has only recently been used as a symbol of peace. It originated in Italy where it bore the word “pace”, meaning “peace” in Italian. In the lead-up to the 2003 invasion of Iraq, many people in Italy and throughout the world hung rainbow flags in their windows and from their balconies as a sign of protest. Ankh: The ankh is an ancient symbol that was widespread in Asia but is generally associated with Egypt. It represents life and eternity. In the 1960s, it was adopted by the Flower Power movement as a symbol of peace and truth. Hand-gesture peace sign: The hand-gesture peace sign is made by holding the index and middle fingers in the shape of a “V”. It originated in World War II when the letter “V”, for victory, was painted on walls in the dark as a symbol of freedom from occupying forces. 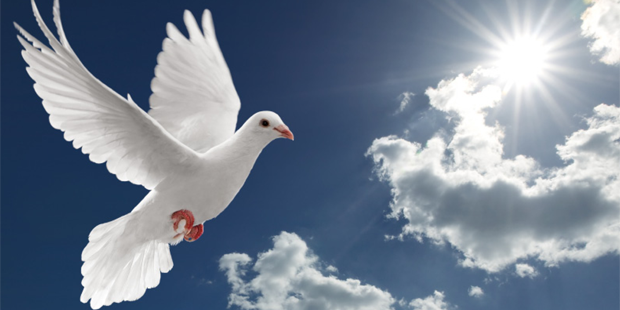 Peace dove: The dove is known the world over as a symbol of peace. According to legend, witches can turn themselves into any bird shape other than a dove. The dove was popularized as a symbol of peace by Pablo Picasso in his 1949 lithograph for the International Peace Congress in Paris, France.